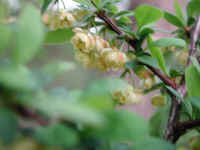 (Japanese Barberry (Berberis thunbergii) - 01) The Japanese barberry is non-native species that has naturalized into the countryside from ornamental garden bushes. 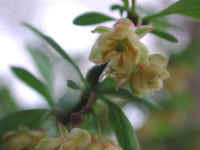 This bush was photographed in the second week of May when it was in fill bloom, but since the flowers are small and hang down below the leaves on the branches, they are hard to see. 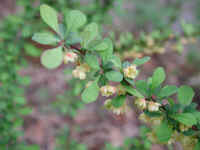 Japanese barberry is a thorny bush that can grow from 2 to 8 feet tall and spread out to about 5 feet wide. (Japanese Barberry (Berberis thunbergii) - 02) In this photo, we took a closer look at one of the Japanese barberry branches. 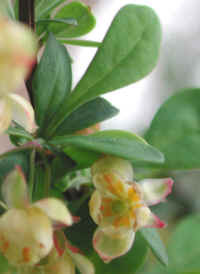 The flowers are small and measure only about 1/4 inch across (1 inch = 2.54 cm. 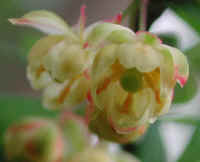 ), and hang down as single, double, in four bloom clusters, all of which are shown in this photo. 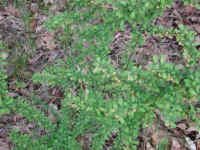 The leaves measure only about 1/2 inch long, but some can grow to three times that length. 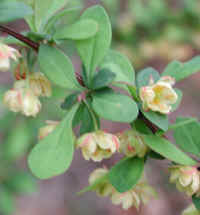 (Japanese Barberry (Berberis thunbergii) - 03) This is a closer look at some of the Japanese barberry flowers. (Japanese Barberry (Berberis thunbergii) - 03a) The branches of the Japanese barberry are deeply grooved, as can be seen on the left side of the photo. 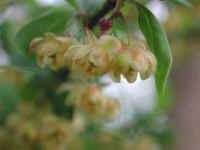 We can also see that the leaves grow in clusters or whorls. 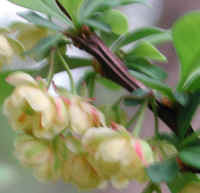 (Japanese Barberry (Berberis thunbergii) - 04) In this photo, we are looking up into one of the umbrella-shaped flowers of the Japanese barberry. (Japanese Barberry (Berberis thunbergii) - 05) In this bee's eye view of the Japanese barberry flower, we can clearly see the 6 petals, with a stamen hugging each petal, and a central pistil. 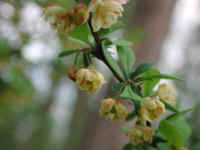 (Japanese Barberry (Berberis thunbergii) - 06) This is another view of a flowering branch of a Japanese barberry. 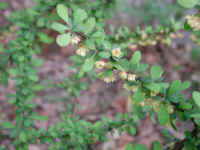 (Japanese Barberry (Berberis thunbergii) - 07) This is another Japanese barberry flowering branch in which the deeply grooved brown branches are clearly visible. (Japanese Barberry (Berberis thunbergii) - 07a) In this photo, we have a closer look at a deeply grooved branch segment of a Japanese barberry. Note that the grooving extends from node to node, but does not go through the node. 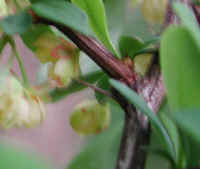 (Japanese Barberry (Berberis thunbergii) - 07b) In this photo, we have a closer look at a sharp solitary thorn growing from the node on the branch of a Japanese barberry bush..
(Japanese Barberry (Berberis thunbergii) - 08) This is photo of a couple of Japanese barberry flower clusters. (Japanese Barberry (Berberis thunbergii) - 09) Since the umbrella shaped flowers of the Japanese barberry hang down, it is difficult to get a bright photo of the inside of the flower, since it has the bright background of the sky.